The Walking Liberty Silver Half Dollar was struck by the United States Mint between 1916-1947 from a composition of 90% silver. The coin contains 0.36169 ounces of the precious metal. In the early 20th century, President of the United States Theodore Roosevelt initiated a movement to beautify the circulating coinage of the country. While the process of instituting new designs lasted for several years, there are two which immediately come to mind as favorites among collectors — the $20 Saint-Gaudens Liberty Double Eagle and the Walking Liberty Half Dollar. They are favorites because both are considered to contain some of the most beautiful designs ever be minted on a coin of the United States. Completing the Walking Liberty Silver Half Dollar design was noted artist and sculptor Adolph A. Weinman. Weinman was an immigrant to the United States and arrived at the age of 10. His interest in the arts was apparent and he began studying in earnest by the age of 15. Perhaps Weinman’s two best known works are this half dollar and the Winged Liberty Head (Mercury Dime) which appeared from 1916-1945. Despite being famous for these coins, Weinman always opposed being called a medallist and preferred instead to focus on his sculptures. 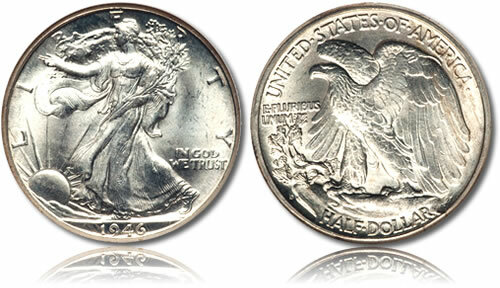 On the obverse of the Walking Liberty Silver Half Dollar, a full-length Liberty is shown striding to the left. She is wrapped in the Stars and Stripes and is depicted holding branches of laurel and oak in one arm. Her other arms is outstretched towards the rising sun’s rays. The inscriptions surrounding her image include LIBERTY, IN GOD WE TRUST and the year. Initial 1916 and some 1917 strikes also contain the mintmark of the coin below the motto. The reverse shows a poised eagle as it is about to take flight with its wings unfurling. Surrounding the eagle are the inscriptions of UNITED STATES OF AMERICA, E PLURIBUS UNUM, HALF DOLLAR and the mintmark for the 1917-1945 coins.